An interesting study of color, line and free form design, this two panel metal wall art will bring instant interest to any space. It includes hot colors like bold pink along with the sedate influence of gray and pale lavender. 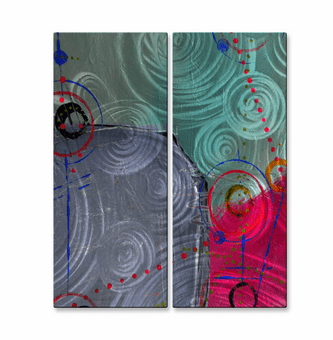 A repeated swirling shape, done both in contrasting color and in hand ground metal highlights, is an underlying theme. Tightly Wound Spirals Wall Panels.